I am looking for your number because my guest is requesting St. Joseph’s Inn for their accommodation for their upcoming visit to Sagada on November 16-18, 2009. You can reach me at 09285003866. I’m hoping for your favorable response. My name is Roland Go, a director of Rotary Club of Bagumbayan-Manila. We will visit Sagada and stay in your hotel on April 9-11, 2010. Together with our tour, we will be donating some medicines to Dr. Venancio Natividad of St. Theodore’s Hospital. Together with this, we would also like to donate some dictionaries and thesauruses to a public school. We were hoping that you can refer a school which is near your hotel. If yes, please e-mail of text me name of school, principal, librarian and its contact no. Your help will be highly appreciated. Hope to hear from you soon. Thank you. ma’am we would like to have your contracted rate for 2011…my guest is requesting to stay in your hotel this feb.3 to 5……we need your reply as soon as you read our email thank you very much…. hi! i am Joy hernandez from the University of the assumption Pampanga.. The UA NSTP had been there last 4years ago in Sagada for our annual outbound and stayed on your hotel. we are planing to go again to sagada for our team building. may i ask if you can accommodate us this coming April? If possible in the first or second week of april. the participants are about 20 to 25 persons. Hope to hear reply/feedback from you the soonest. 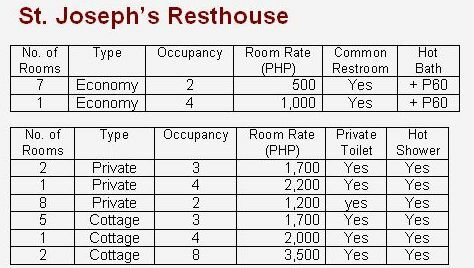 My friends and I want to spend the holy week in your resthouse. i want to ask some infos…could you pls contact me ASAP @ any of the following nos. so we can already arrange the reservations. By the way, i’m RV Gaudia, from Sampaloc, Manila. i would like to inquire if the cottage for 4 persons will be available fr april 21-23, 2011. if it will be available, then can i reserve it? we will be going to sagada on april 21. I am calling you because my Boss is requesting St. Joseph’s Inn for hime and his wife for their accomodation for their upcoming visit to Sagada this coming August 19 – 22. I’m hoping for your favorable response on this matter. you can reach at Tel #(02)852-8737/Cell # 0917-5635964.